Lacking a Boston doorway this week, I thought I would present one of the many Parisian doorways I shot last April. i don't know how you could ever lack for an interesting boston doorway but this is a delightful substitute, coatrack and all. Amazing! 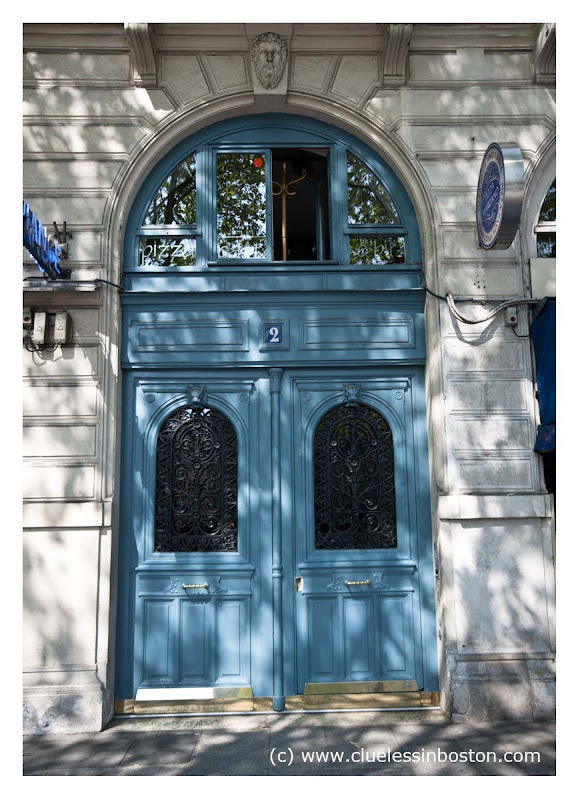 I posted a blue doorway in Paris yesterday. I wonder how many blue doors there might be there anyway? A million? This one is great in detail and a luscious blue. What a gorgeous colour and ornaments! Parisian and so romantic door! Magnificent! The color is striking~ almost robin's egg. Lovely! I was thinking of Genie's blue doorway from yesterday, too. This one is interesting, but they got pretty confused in the transom windows, didn't they? They chose the right color, looks so festive. Blue doors in Paris -- a good substitute for a Boston door photo. I love visiting both cities.